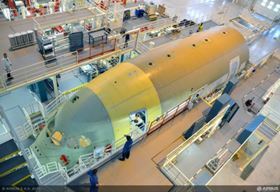 This phase will continue over the coming weeks, and once completed, the front fuselage will be transported to the A350 XWB Final Assembly Line in Toulouse. It will be the first major section of the A350 XWB to enter the final assembly line. Airbus has reportedly delivered the first A350-1000 to Qatar Airways earlier today, following successful FAA and EASA Type Certification on 21 November.